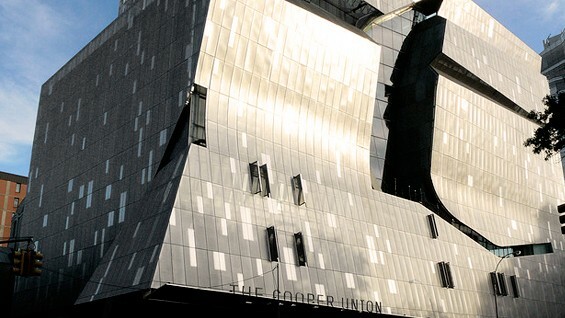 The construction of 41 Cooper Square, The Cooper Union’s first new academic building in half a century, is virtually complete, just a little more than two years after the official groundbreaking on May 7, 2007—a brilliantly sunny day that was most auspicious for the enterprise. It is truly remarkable that this architecturally extraordinary, technologically innovative and environmentally advanced nine-story building,with two additional floors belowgrade,will be filledwith students and faculty on the first day of fall semester classes—September 8. 41 Cooper Square was designed by Pritzker Prize-winning architect Thom Mayne and his Santa Monica, California headquartered firm,Morphosis Architects, supported byNewYork City-based Gruzen Samton Architects and built under the guidance of F.J. Sciame Construction Company. The unique stainless-steelmesh exterior, pierced by windows on the front façade opening onto the dramatic, full-height atrium within, is complete. The elevators are running; the sensor-triggered lights turn on when people walk into rooms; the laboratories have been fitted out; furniture has been built in and the interior has been painted a special Cooper Union white. Signage identifying the myriad spaces and recognizing the many very generous donors who have made the building possible is being fabricated and installed. The moving company is transferring laboratory equipment out of the old Engineering Building and into the its new home. The completion of 41 Cooper Square was timed to mark the 150th anniversary of The Cooper Union’s existence—and it has given us a running start on our next century and a half as one the nation’s most esteemed institutes of higher education.